Introduction: I am republishing selected posts from Cohencentric (my former Leonard Cohen site), especially those offering information not available elsewhere, here on AllanShowalter.com (these posts can be found at Leonard Cohen). The following entry was originally posted Aug 16, 2017 on Cohencentric.com. Long after the event, I continue to receive questions about the cause of Leonard Cohen’s death. I am posting about two pertinent medical issues in hopes of resolving some of the confusion. Please be aware that this post reveals no facts about Leonard’s death that haven’t been previously published. Instead, I offer a physician’s take on the available information. Leonard Cohen died during his sleep following a fall in the middle of the night on Nov. 7. The death was sudden, unexpected and peaceful. 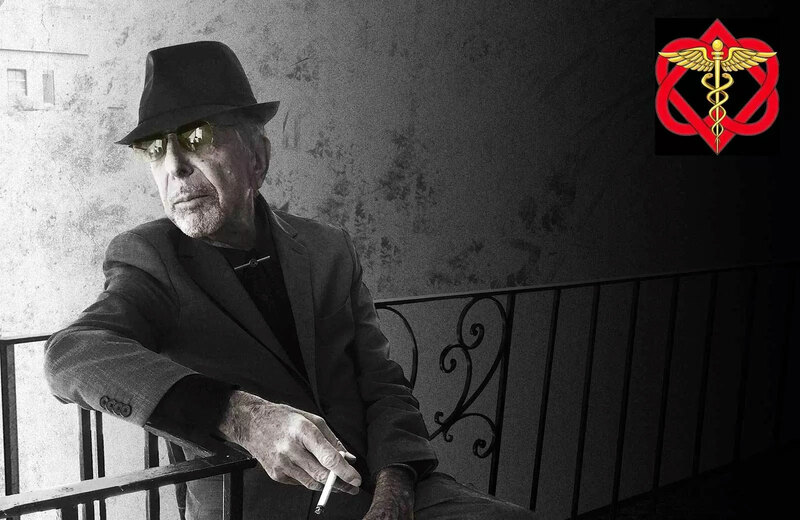 Although Leonard Cohen had been suffering from cancer, it was not the cause of his death last week. According to his manager, Robert B. Kory, it was the result of a fall he had recently suffered. In reality, however, the explanation of Leonard’s death may well involve the combined effects of the fall and leukemia. First, treatment for leukemia, as well as for pain or other symptoms of leukemia, may increase the risk of a fall. In summary, the most likely clinical interpretation of the presented data is that Leonard’s death was the consequence of bleeding which was immediately triggered by his fall and which continued unabated because of a coagulation defect, which was itself caused by leukemia. Some writers have questioned why no medical intervention was mentioned in the announcements of Leonard’s death. Given Leonard’s well-publicized statement, “I am ready to die. I hope it’s not too uncomfortable. That’s about it for me,”5 he may well have made similar arrangements. If so, a no heroic measures provision might have precluded a call for medical assistance. Again, I want to emphasize that this post is a medical perspective on, rather than an investigation of, the events surrounding Leonard’s death. The key conclusion is simply that, while I have no definitive proof that the scenarios I’ve outlined are indeed what took place, they do represent reasonable, unstrained clinical explanations of the available information. If this seems anticlimactic, it’s because my personal belief is that the loss of Leonard Cohen was a tragedy, not a mystery.